I'm known mostly as a conservative, libertarian economist. So, it is a surprise to some of my friends that I favor some form of government healthcare. For one thing, everyone deserves access to some basic level of service, as is the case in every other developed country. Second, other countries' government-operated systems are much cheaper. I'm sure you know exactly what I'm talking about. But, here are some interesting facts that you may not have known. Presently, the U.S. accounts for about 50% of all healthcare spending in the world. Second, the U.S. government -- federal, state and local -- accounts for about 45% of all U.S. healthcare spending. In other words, the U.S. government is already spending about 22% of all the healthcare spending in the world, or about 7.5% of U.S. GDP. From this, we can come to a quick conclusion: no "healthcare reform" plan is going to work that involves spending more money -- via additional taxes, mandatory insurance, and so forth. That would just make the problem worse. You would think this is as obvious as gravity. I think that 22% of all the healthcare spending in the world is probably enough to put together a pretty good healthcare program for the 5% of the world's population that lives in the U.S. In other words, a universal program whose budget consists of the money that the government is already spending. Then, we wouldn't need any new taxes. We're already paying for a universal healthcare system. We're just not getting it. This is well below the 16.5%-of-GDP level of spending today. But, 8.5% is rather high by historical standards. Actually, I think about 6% is a more reasonable figure -- the level of spending in the U.S. in 1968. 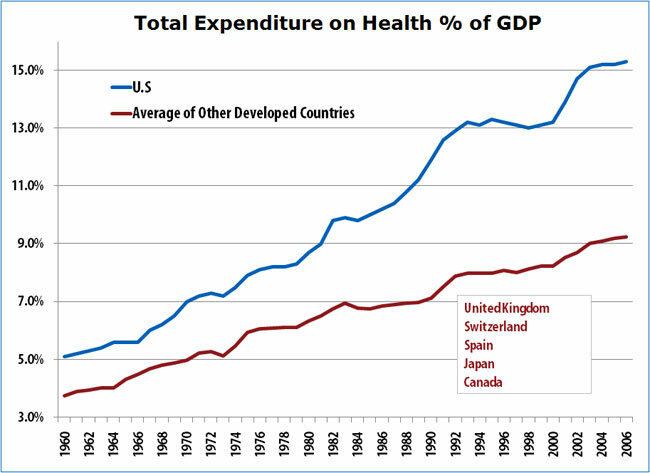 Most of the world's developed countries had healthcare expenditures/GDP ratios of about 5.0% in 1970, when most of them had already adopted a national system. By 1990, it had risen only to about 7.0%, and hit 8.5% around 2001. So, 8.5% is more than enough. What does this mean? We would have the kind of universal coverage that liberals dream of. But -- get this, conservatives -- we would also have almost no corporate health insurance costs. That defined-benefit healthcare plan that is blowing up? The sort that killed General Motors? Problem solved. And no new taxes! What form could this plan take? A single-payer system has been successful in many countries. However, we already have a single-payer system -- Medicare -- that is being scammed remorselessly, and which many people think will disintegrate in the future due to escalating costs. The government's own economists expect Medicare spending to rise to $884 billion in 2017, from $427 billion in 2007. Some people wouldn't like the service they got at the state-run hospital -- just as they might prefer to have their kids in private schools rather than the public schools. No problem. You can use whatever private service you like, but you have to pay for it. Which is no different than the system we have today, without the option of a state hospital. Most healthcare proposals today seem to create more problems than they solve. That's why nobody is very excited about them. Democrats might find that a more ambitious plan would get Republican support if it solved the fundamental problem -- excessive costs -- while avoiding additional burdens in the form of taxes, mandatory participation and piles of regulation. That's just good politics.